Making Medical Lab Quality Relevant: The Quality Tree Reenvisioned. So I was going through my regular update and revision exercise for my presentation files. I find it I don’t do this regularly, they can get very stale, and I get bored talking and teaching about Quality. I suspect that I am not alone. Anyways the target audience this time is medical laboratory physician trainees. I don’t think I am giving away any secrets when I say that this is always a tough audience. Most of this group have a singular attitude about quality which is unfortunately “What???? DKDC!! !” or, for those uninitiated, “Don’t Know and Don’t Care”. Fortunately we are able to get enough face-time that they may have some idea about where to start. So one of the concepts that I have worked with over the years is the Quality Tree. Don’t think of Quality as a pyramid with Policy being at the tip-top and its effect trickling down; rather, invert that pyramid and put Policy at the bottom, as the foundation, with its impact shoring up the rest of the process. 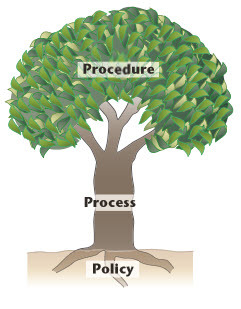 From there it was an easy step to creating an analogy as a Quality Tree with the roots that give support and nourishment as Policy. But recently as a result of our working on and achieving the recent certification of our laboratory’s quality system to ISO9001:2015 (YAY !!! ), I realized that this was a good step in the right direction, but was still incomplete. 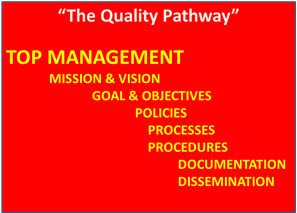 Quality starts with Top Management envisioning the organization’s Mission and Vision and setting the organization’s Goals and Objectives. Once those are in place, then all the rest can and will logically and consistently follow. For the purpose of this re-positioning of activities, I set up a set of definitions, that work and make sense. Mission and Vision are general statements about who we are, what we are doing, and what we want to become. Goals and Objectives follow on from the Mission and Vision, and are very specific and focused on what we expect to be doing now, and in the near and intermediate future. Mission and Vision and Goal and Objectives are the real drivers of our Policies and our Quality System. This is what really nourishes Quality. Once those are in place we can create policies and processes that are consistent with our plan, and procedures that follow. The fruits of our labour are not only our products and services, but our Quality message as well. And we can then point to our need to disseminate that message, through a clear and distinct error-free and consistent documentation pathway. 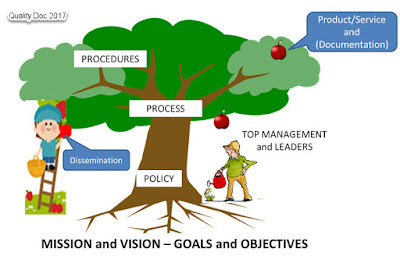 And Top Management is the gardener whose task it is to care for and nourish the Quality Tree and ensure that it remains healthy and vital and strong. I know this is sounding pretty “in the weed’ish” but in my mind it all becomes clear through my new Quality Tree picture. Quality is like every other subject that has both academic and practical applications. I don’t think these applications can be easily separated. If thinking people don’t understand the foundations, then applying the practical rules is done only by rote, and all too often gets screwed up. And equally important, if the academic purists don’t appreciate that Quality is not theoretical, it has to be applicable in a way that makes sense. So for me, the picture works. If, upon consideration, it also works for you, use it. I put it out here in the spirit of open access. Or maybe I have too much time on my hands.